The world’s leading match racers have until 5pm (GMT) on Monday 17th January to make the final preparations to their application for a Tour Card on the 2011 ISAF World Match Racing Tour (WMRT). Nine Tour Cards will be awarded to teams which grant them entry to a guaranteed minimum of six stages on the Tour. The 2011 Tour will once again consist of at least 9 races, kicking off in Marseille with Match Race France on 10th May and concluding with the Monsoon Cup in Malaysia on 27th November (full itinerary below). WMRT rules state that the winner of the previous season has the option of taking up a Tour Card for free while the second and third place skippers are guaranteed Cards in return for bids of USD10,000 and USD20,000 respectively. 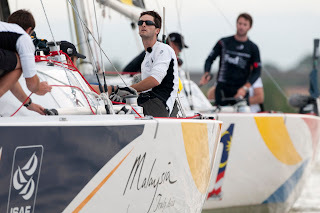 However, 2010 Champion Ben Ainslie has ruled himself out of the full season, having committed to pursuing Olympic qualification in the Finn Class. With the 2011 WMRT set to the be the richest sailing series in the world with a record USD 1.75 million up for grabs, applications for Tour Cards are likely to be more competitive than ever before. With 2010 runner-up Matthieu Richard (FRA) French Match Team and third placed Torvar Mirsky (AUS) Mirsky Racing Team expected to take up their Card options, the scramble for the remaining 7 places is set to be highly competitive. It is anticipated that there will be added competition for places from the new generation of match racing stars that started to break through in 2010, such as Phil Robertson (NZL) WAKA Racing Team while interest is also expected to be high from former World Champions such as Peter Gilmour (AUS) YANMAR Racing, Ian Williams (GB) Team GAC Pindar and Jesper Raddich (DEN) Gaastra Racing Team making the race for places even more intriguing. Teams making bids will be notified whether they have been successful on Friday 21st January 2011. In the case of bids being matched, the WMRT will base its selection on a set criteria including: current or past Tour or ISAF Ranking, recent achievements in other sailing disciplines, media awareness and PR plans, sailing skill and a demonstrable financial and logistical commitment to the 2011 season*. Tour Director Craig Mitchell, said: “We have worked very hard to make the WMRT one of the most appealing series in the world to sailors and are expecting yet another highly competitive bidding process. The record prize money will obviously be a pull but what also attracts teams is the knowledge that they’ll be racing against the very best crews in the highest quality match racing.